This "magic" ball can answer all your questions! Go ahead: Ask it a question - It will answer! Buy 1 for $11.79Buy 2 / Save $0.63!Buy 3 / Save $2.36! Size (inches): 4.09" X 4.13" X 5.31"
This is a great item. It's great for anyone needing quick relief from the nagging questions like 'Does Jeff like me?' or more serious adult questions like 'Will i get this business report done by the due time?' The magic 8 balls responds with strange answers such as 'reply hazy try again.' or 'No.' You will have lots of fun with this toy! Product is a great gift. Lots of fun. Best service on the net! Short shipping period, not expensive. Anything here is a great buy! Thank you so much for your great service! The magic 8 Ball is a christmas gift for my boyfriend, and I spend three hours on the internet looking for a company that could ship overseas, but no one did except you! 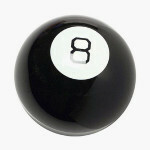 The magic 8 Ball was just as cool as I thought it would be, and thanks to you it will be a very appreciated gift! I am very satisfied, Zooscape is very serious and my magic 8 ball is a super toy. a stupid inaccurate little device isn't it? The product is great fun! Just what I expected! Its magic dazzles everybody, children and adults. It is beautiful, resistant and it works like a charm! 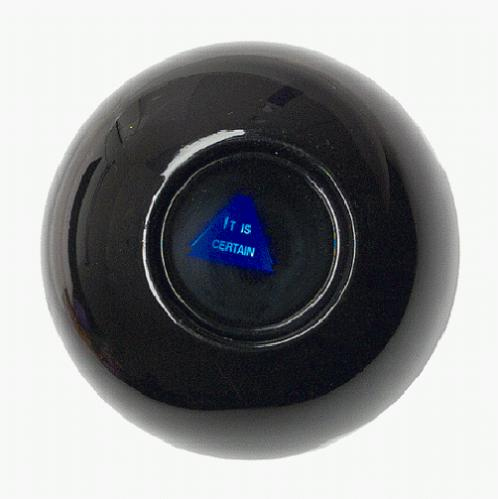 the liquid in the magic 8 ball is old. it doesn't work good. I'm disappointed of the quality. It's was very good and i receive it in good time. Thank you.